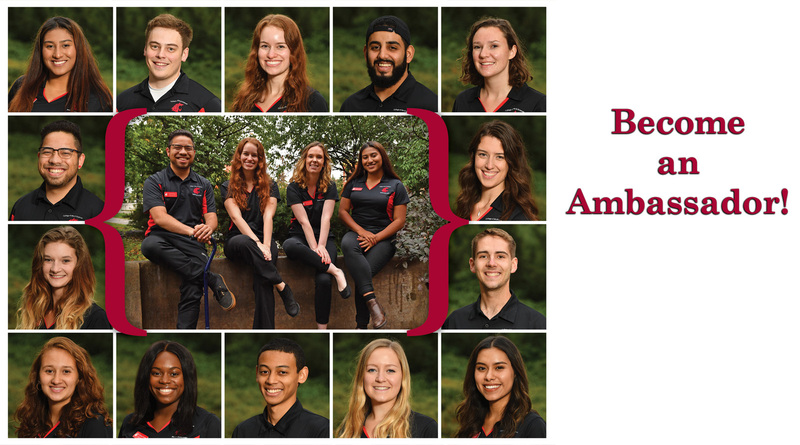 The Student Ambassador Program for the College of Arts and Sciences seeks to enhance the college experience for prospective and current students at Washington State University. Ambassadors serve as student liaisons to the college and represent the college at all recruitment and retention programs. In addition, ambassadors plan and sponsor events and programs designed to meet the needs and interests of students in the College of Arts & Sciences at Washington State University. Candidates must complete at least 24 WSU semester credits on the Pullman campus by Fall 2019. Candidates should be certified in a College of Arts and Sciences major OR provide evidence of involvement and participation in their chosen academic field within the College of Arts and Sciences. Strongest candidates will be actively engaged in the WSU community. Candidates must be comfortable communicating with the public. Candidates should have a minimum 2.7 WSU cumulative grade point average. Two references are required; at least one must be a WSU faculty or staff member. Do CAS student ambassadors get paid? Yes, ambassadors are paid an hourly wage to attend monthly mandatory meetings and training, all approved and assigned recruitment activities, and College of Arts and Sciences events. The CAS Student Ambassador program is a registered student organization (RSO) with a mission to identify the needs and interests of fellow CAS students and to plan programs to address those issues. Time spent working on the RSO programs is not paid. New ambassadors are required to attend three training sessions during the spring semester and to complete a couple of assignments. They may also attend recruitment and retention events and participate with veteran ambassadors – however, students will not receive compensation for these hours. No compensation is allowed until after July 1, 2019, when training is complete and the new fiscal year begins. All ambassadors are required to attend monthly meetings/training sessions, which are scheduled on Sunday evenings. Elected officers will attend an additional meeting once a month in order to plan and prepare for the general monthly meeting. Time commitment varies depending on the ambassador’s availability to attend events but, generally, an ambassador will attend 3-4 events each semester, usually on Saturdays. Additional time will be spent on program planning and preparation. If I’ve completed my application but my reference is not received by the due date, what should I do? As long as your application has been submitted, your references will be accepted after the deadline. Applicants should confirm receipt of all materials if a confirmation email is not received. I’m new to WSU (transfer or freshman) and I’m not sure I can find a WSU faculty member to complete a reference. What should I do? First of all, don’t be afraid to make the request even if you don’t know them well. Provide them with documentation of your involvement, your resume, etc., so they can know you better and provide a more complete reference. References from an academic advisor or other WSU staff member who has worked with you is allowed. If all else fails, contact Arlene Parkay to discuss other options. See contact information below. My grade point average is below the required 2.7. Is it okay to apply? If your GPA is within a reasonable range of the 2.7 requirement, go ahead and apply. If you are chosen to be an ambassador, your status will be reassessed once the spring semester grades are available. If at that time your GPA does not meet the requirement, your status will remain on hold and can be evaluated again after the fall 2019 semester. I’m considering studying abroad for a semester during the 2019-20 school year. Should I still apply? Yes. If a candidate is strong enough, the selection committee may certainly choose a student who may be gone for a semester, especially if that student is not graduating in May 2020. I’m graduating in December 2019 – should I apply? The selection committee may choose to hire a really strong candidate who is graduating in December 2019, but priority is given to applicants who are available for the full academic year. What criteria does the selection committee consider when choosing student ambassadors? Academic strength: Students who can take on the ambassador responsibilities without affecting their academic standing. Involvement in department/college/university activities: We are looking for students who are engaged in the university in some way (clubs, community service, etc.) and who demonstrate a desire to improve the recruitment and retention of College of Arts and Sciences students at WSU. Ability to write well as evidenced by the application. Personality: The ability to connect with others. Not every ambassador has the same personality traits and strengths – and that’s okay! Diversity: We are looking for representation across our academic majors, and we consider age/class, race/ethnicity/culture, transfer/high school, resident/non-resident backgrounds as well. Will I be called for a personal interview? Yes, all applicants who meet the requirements must attend the complete interview process, which will include large and small group activities, a panel discussion, and a one-on-one personal interview. The mandatory interview is scheduled for Sunday, Feb. 24, 2019.